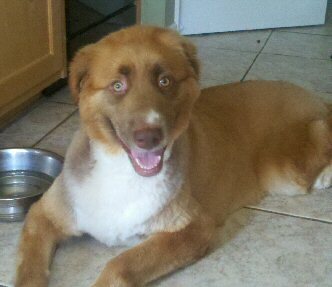 HAPPY ENDINGS = HAPPY TAILS!!! 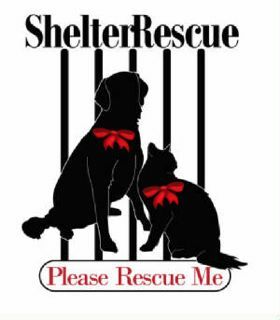 Shelter Rescue and Please Rescue Me thanks you for sending us your "Happy Tails"! Nothing delights us more than to read your emails and to share them with others because everyone loves a happy ending! There is something special about shelter pets! 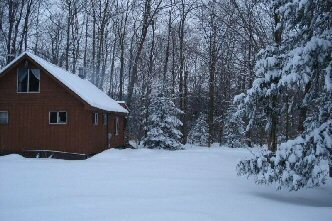 Thank you for opening your heart and home! A HAPPY UPDATE FROM THE DOYLE FAMILY! not talking much since older brother translated his baby talk for him. love her. We are thankful to have her in our lives. 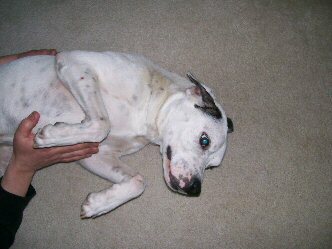 "Sweet Pea"....now known as "Shiloh" is getting LOTS of hugs! 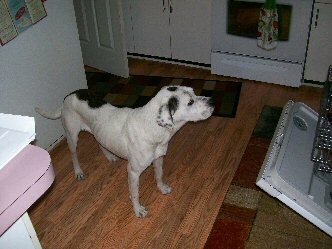 Here is a pic of "Sweet Pea" that was going to be PTS until we committed to her. 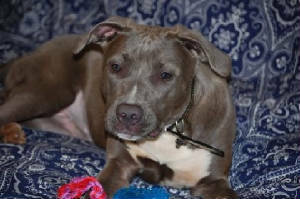 We called her "Kenya" but her new family renamed her "Shiloh". She is pictured with the granddaughter of the family in Egg Harbor Township NJ. 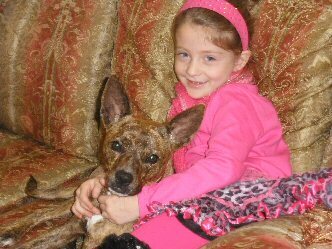 She is an AMAZING sweet loveable dog that ADORES children. Thanks for allowing us to find her a wonderful home. They are so in love with her! An Update From Our Favorite....."Henley"!!! 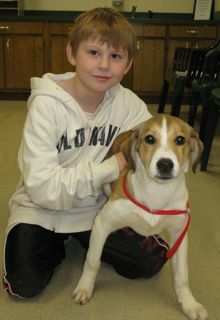 "Eddie" Hits the "Forever Home" JACKPOT!! Just wanted to let you know the 3 of us got home safe last night through the torrential downpour of rain! Eddie did fine in the backseat with Bob..he was very quiet and just looked out the window. We had a towel around him because he was wet from being outside...he looked just like E.T.! So cute! We got him home and let him sniff around the house and get used to it. He was very calm and just laid in the living room and we petted him for an hour or so! We did have a crate set up in our room, but he was reluctant to go in it (we put treats in) but he ate them up and got out. We closed our bedroom door and he slept nicely next to the bed on the floor most of the night. Just had to pet him a few times during the night to reassure him that all was well. When we do have to both of us go out though, we will definitely crate him until we know what he'll do! 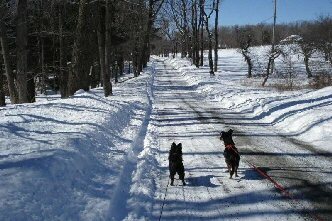 Bob home with him all day today and they have had breakfast and been out on several walks on the leash already! 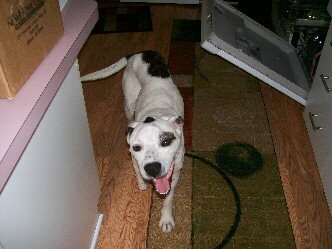 Hi Everyone, We took one of your "Urgent dogs" about 3 years ago; she was scheduled to be put down the following day. We named her "Lucky" and she has been one of us every since. We even take her on some of our short-drive trips. 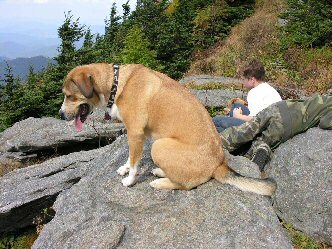 I've attached a photo of her with us on fall break at Mt. Mitchell, NC. If you want to post it on your website, etc., please go ahead. Who knows - it may help convince someone to adopt one of your dogs! 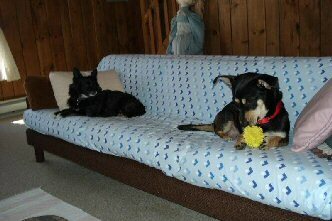 B-15 was brought into the shelter along with her brother. This little girl was very scared and was extremely hard to get to know. That is...until her new best friend came along and the rest is history! Last time we checked, her name was possibly going to be "Lilly" but still needed some thought. Whatever the name...she has a new best friend (and vice versa!). This sad fella had been at the shelter since 11/24/10. He was sad, depressed, scared and seem to be unapproachable. That was...until his new family saw him and it was love at first sight. This fella changed the moment he leaped out of his kennel to meet his "mom". There were smiles all around (including ours!). This is a happy ending that we will remember for a long, long, LONG time! 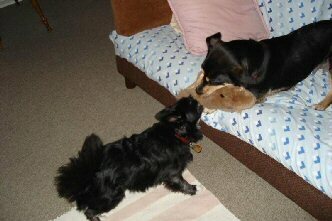 Coco fell in love with ""Major" at CCAC and the feeling was mutual. Who could doubt the devotion.... Just look at that picture! Thank you, Coco, or opening your heart and home to "Major". He is a treasure and we thank you for realizing that! And that, folks, is what we call a HAPPY ENDING! "Daisy" and Annie.....a match made in heaven! 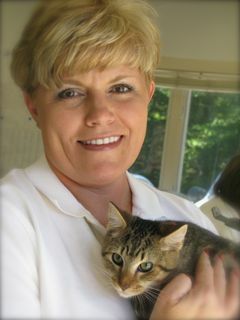 Annie told us that she came to Coweta AC to look for a kitty companion after seeing a posting of the many kitties that needed loving homes. Annie walked into the kitty room and she said that "Daisy" spoke to her and that was the end of her search! I think you will agree that this is a match made in heaven. We overheard a little boy ask her if her kitty was going to live outside. 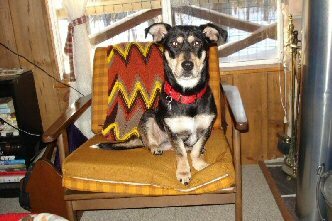 Annie answered that "Daisy" would have a loving home inside where she would be safe and sound and never want for anything. Now that.....is a happy ending! "Maxine" Finds a Best Friend! "Maxine" was quite shy at the shelter but once she met her true best friend, Branch, she started wagging her tail! This looks like a match made in heaven and we are thrilled for "Maxine". Branch was such a little gentleman and treated "Maxine" with such love and care. Thank you for opening your heart and home to this wonderful lady!! "Miguel" waited and waited.....He finally got his HAPPY ENDING! Little "Miguel" was losing hope of ever finding his forever home....However, they say that all good things come to those who wait. That saying came true for this little fella. 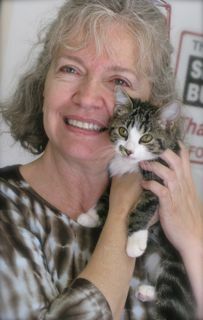 Miguel's new mom gave him lots of hugs and the promise of a loving, FOREVER home! "Apollo" (#15406) Gets Family Approval! Well, it seems that some things are just meant to be. Such is the case with Apollo, #15406, at Coweta County Animal Control. 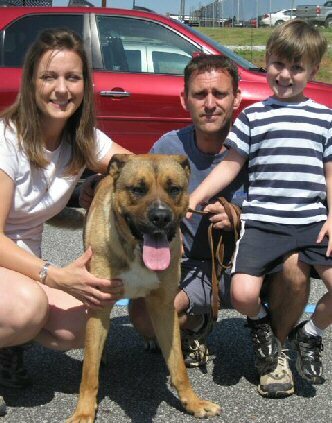 Apollo was recently adopted from CCAC but returned because his family could not afford to have him neutered. 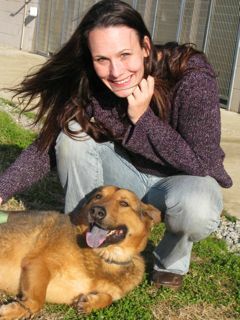 Thank goodness Claire came to the shelter and fell in love with Apollo. That was very important but Apollo had to pass another very important test....that is...to be fully approved by granddaughter Olivia! Well, Apollo won Olivia's heart when he sat and shook her hand. Needless to say, mom Susannah was smitten as well. All in all....Apollo won EVERYONE'S heart! 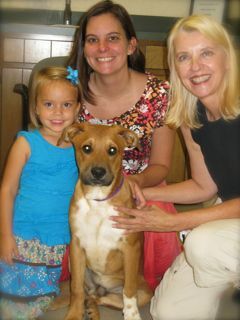 Thank you Claire, Susannah and Olivia for opening your heart and home to Apollo! 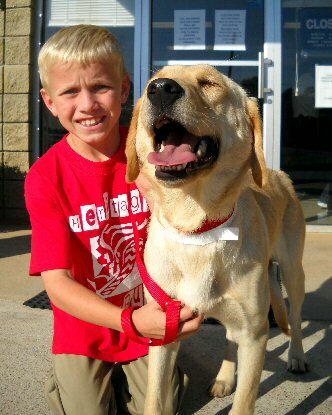 "Budda" (#14572) Finds His "Happily Ever After"! 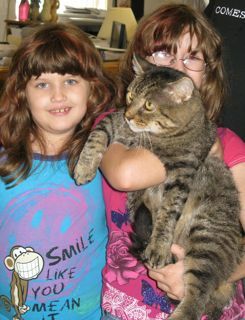 It was certainly love at first sight when Kayla & Kaitlyn saw Budda at Coweta County Animal Control and we have a feeling that Budda felt the same! You would have smiled ear to ear to have seen Big Budda being carried by Kayla & Kaitlyn....TOGETHER! We had a feeling that Budda was going to be one spoiled kitty and we were right. Mom gave us an update and Budda is living the life of luxury. Now that....is a HAPPY ENDING! 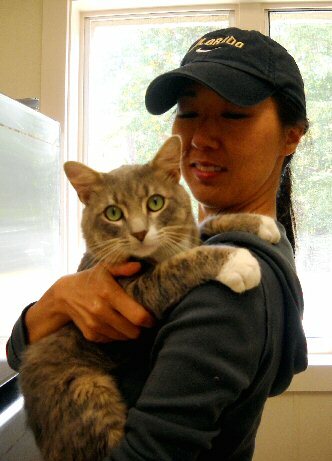 "Julius" (#14553) + Beth = HAPPY ENDING! Everyone loves a happy ending and we wanted to share one with you. Little "Julius", #14553, was running out of time but when Beth saw this cute little fella.....it was LOVE at first sight. Thank you Beth, for opening your heart and home to this sweet little man! A wonderful puppy Happy Tail! Remember B-5 #14091 named "Kayla"? Just wanted to let you know the puppy we adopted is doing fantastic. 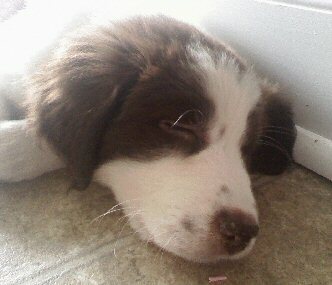 She has been renamed Lorelie, and has gained 7 lbs. Pretty good being we just adopted her 5-4-10. She gets along great with our cats, aussie mix, and our 2 year old daughter. She doesn't quite understand why the cats don't want to play with her though. She is doing great on house training, and has already learned to sit and lay down on command, and the command drop it. We originally came to the shelter to look at an adult corgi mix we seen on your site, but wound up falling in love with her instead. Funny how things work out sometimes. Well we will keep you posted with her progress. For now here are a few pics. Sorry most of them are of her sleeping but that seems to be her favorite past time. All good things come to those who wait.....right "Andrew"??! Now this.......is a HAPPY TAIL!!!! On Friday, April 9, 2010, we met some very special men. They had driven all the way from the north side of Atlanta because they saw A-2 #13838 on our website. They felt that this sweet girl would have not stood a chance of getting adopted and her picture and video touched their hearts. They took a lot of time with A-2 and in the end, she was standing, wagging her tail and they saw the potential behind a scared shelter pet that only needed love to build confidence......thank goodness!!! Thank you, Kevin & Ben (with special support from Craig who kept us all laughing!) for opening your heart and home to A-2.....now "Mary". Also, thank you for your donation into Shelter Rescue's donation jar! We do what we do because of stories like this!! "Sebastian"! From Shelter Pet to Beloved Pet! 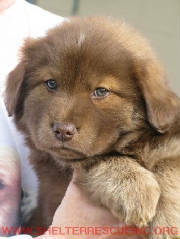 I just wanted to update you guys and share some pictures of the chow/retriever mix, now named Sebastian, that we adopted from Coweta County Animal Shelter last week. 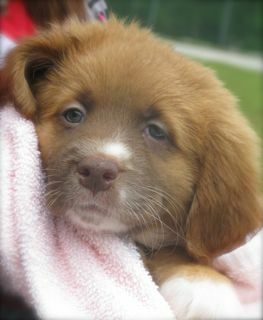 The day I saw him I had come to the shelter to look at another pup, which unbeknownst to me had already been adopted. But there little Sebastian was, in someone's arms behind the counter. Somebody had just brought him in before I got there; I was the first potential adopter to see him. So, I knew from that moment that he was meant to be a member of our little family. Now he's all settled into his new home; we got him set up with a Banfield puppy health plan and he's doing well with house training. He's such a sweet puppy who loves everyone. 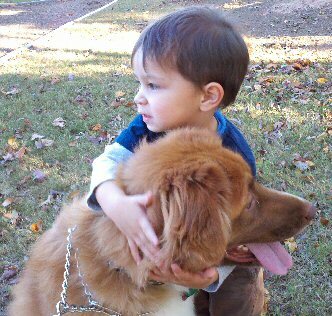 He's great with children and he adores our other dog, Sheldon. They're inseparable. We just wanted to say thank you for everything. Sebastian is such a precious blessing, and we love him so much. We're grateful for the work you guys do; for without it, we would never have found this little angel that makes our family complete. "C-8 #12689" Goes Home With Leah !!!!! 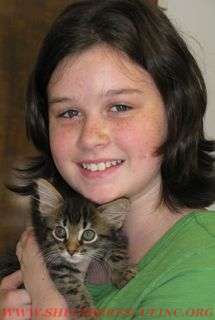 Leah and her mom came to the shelter and fell in love with a special kitty formerly known as "C-8 #12689". Leah thought he was really sweet and looked majestic and we agree! 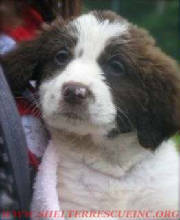 This fella now has a name to fit his regal personality......introducing....."Roognar". Good luck to you Roognar and thank you Leah for opening your heart and home! "A-7" Finds A Home With Ryan & Parker!!!!! Now that is a picture of happiness! 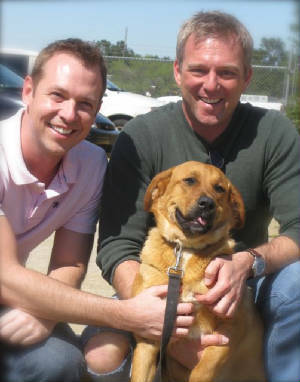 Ryan and Parker were all smiles after choosing their new pup (little A-7 #12719) on 11/23/09. Ryan, Parker and Mom took a lot of time getting to know this little one and once we saw little A-7 curled up on Parker's lap sound asleep.......we knew a decision had been made......on everybody's part!!! Thank you, Ryan & Parker, for opening your heart and home to A-7!